We specialise in plastic Food Warmer that are solidly insulated with polyurethane foam which helps keep the contents hot or cold accordingly for a long period of time. These Food Warmers are made from superior quality plastics that prevent food from contracting any outside whilst maintaining its freshness. 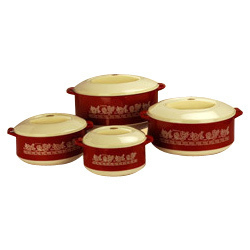 We also supply customized Food Warmers based on the specification of our clients. All our Food Warmers are available in various sizes with inmould as well as screen printed designs. We offer large cosmos food warmer that have high storing capacity. The twin pack feature of this food warmer gives credence to its uniqueness. 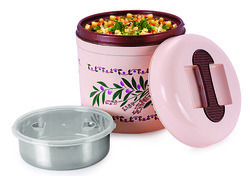 These food warmer are ideal for storing 2 different types of food. Available sizes: 1) 2500 2) 3500 3) 5500.